We’ve had a wonderful week, with all the new students getting settled into classes. We had a few information sessions for new families this week – the Parent Advisory Welcome Coffee, the ES New Parent Orientation, and our Website Orientation session. I would like to thank those who could attend these important events. Another exciting event this week for Elementary teachers is Kathy Collins’ visit! She arrives on the Johannesburg campus today, and many teachers from Johannesburg, Pretoria, and internationally have enrolled in her weekend workshop taking place this Friday, Saturday and Sunday. Kathy will then be at our campus on Monday through Wednesday next week to work directly with grade levels in their classrooms, and on the Pretoria campus Thursday and Friday. Next week, we have a world-renowned reading consultant coming to AISJ to work with the elementary faculty. She will be presenting a parent workshop titled ‘Ideas to support your child at home to become avid, engaged readers’. 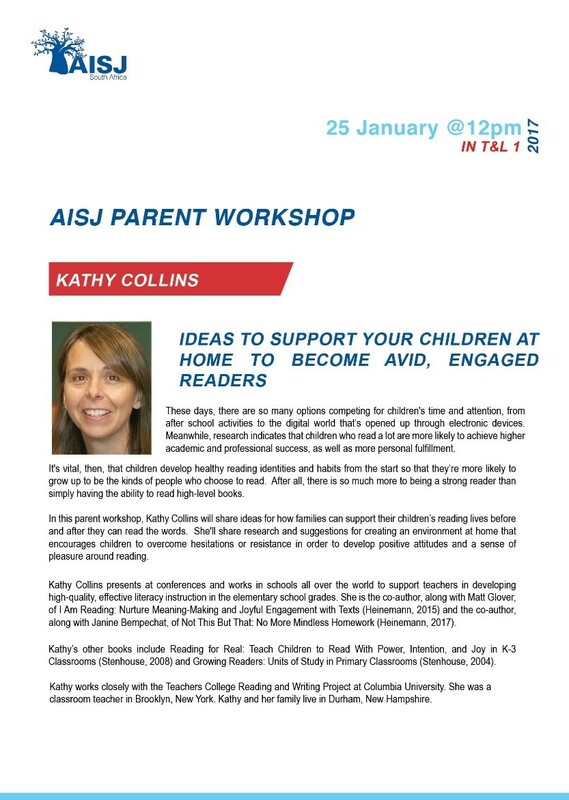 Having read many of Kathy’s books, and attended her presentations before, I would encourage all parents to attend as Kathy is an engaging and energetic presenter, who is well researched and versed in the aspects of reading development for elementary aged children. Don’t miss this wonderful opportunity! This workshop will be on Wednesday, 25th January at 12:00 pm in T & L #1. Opening night of Disney’s Alice in Wonderland is in just two weeks. The cast, crew and production team have been working hard to bring the AISJ community a great show. All involved are very excited and nervous at the same time. The great news is that tickets for the show go on sale on Monday, January 23rd. Tickets are priced at R80 per person (child & adult). They may be purchased from Ms. Carol or Ms. Kgomotso at the ES Office. Please try to pay with exact change. The production team is looking forward to filling up the new AISJ Theatre to capacity. Our new Scholastic Book Club is up and running! Book clubs provide you with an opportunity to purchase good literature for your child at very reasonable prices. Children read more when they choose their own books, so I encourage you to look at the flyers together. Paper catalogues for Mini & XD will be sent home on Monday, January 23rd with your child, and then you can do all your ordering online. If you have any questions, please contact Ms. Zandre at zmyers@aisj-jhb.com or stop by the ES Library.